From the Smithsonian to shifting corporate strategies, Polycom is on a roll. Polycom CEO Mary McDowell and her staff were recently in Washington DC to present Polycom hardware for entry into the Smithsonian. While in town, I caught up with her to discuss this event, the company's change in philosophy around working with competitors, and the recently announced integration of Polycom conferencing technology with Amazon Alexa. The Smithsonian's National Museum of American History was given devices that were part Polycom's development of teleconferencing technologies from 25 years ago. 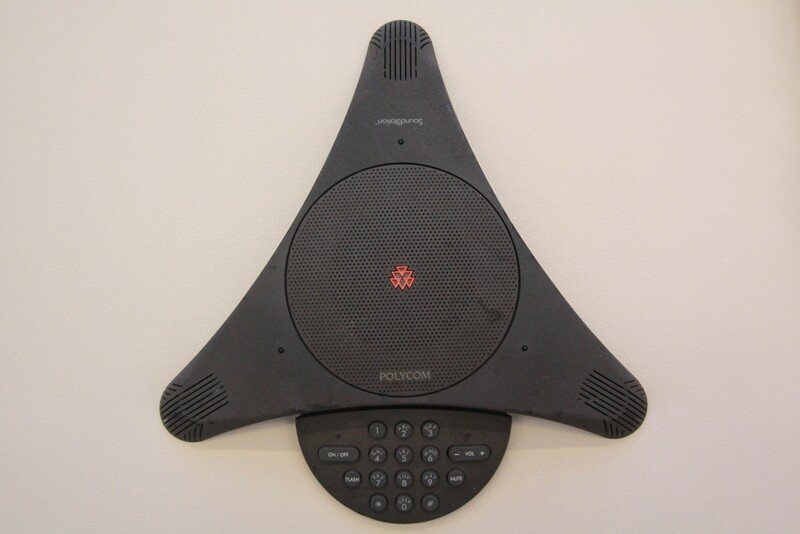 The donation from Polycom included the original wooden prototype, initial breadboard (an experimental version of the circuit) and early drawings of the Polycom SoundStation from the 1990 to 1992 period. The tabletop SoundStation allowed multiple users to participate in a conversation using one device containing advanced, for its time, audio technologies. These early versions illustrate the evolution of the invention from prototype to final product. Polycom also donated Transparent and Blue SoundStations, SoundStation Premier, and the Polycom Trio that was released this year. "Through these and other objects, the museum tells the story of business communications from Alexander Graham Bell's original telephone to modern conferencing technology," said Harold Wallace, curator of the museum's electricity collections. The Polycom devices are part of the more than 25,000 objects in the Electricity Collections, which documents, preserves, and presents the history of electrical science and technologies. The Smithsonian established the Electricity Collections in 1897 with the goal being to convey a better understanding of the changes to our society from the invention and adoption of electrical devices. Have you ever observed a group of people huddled around a laptop trying to conduct a video call? I have, and I'm sure you have as well. It is a cramped situation if you are huddled around the same laptop with several other people. It can also be an isolating experience if you are in the same room, with each participant viewing the conference on five separate screens. If you are remotely joining the conference, your experience is frustrating as well. You can't see the context or all participants at once. You are missing their interactions in their conference or huddle room. Polycom has decided to take the lead in working with Video as a Service (VaaS) providers to deliver an easier and better video experience. In fact, earlier this week Polycom announced a partnership with BlueJeans to give their users the Polycom video experience in the conference room (see "Polycom Continues Marching to Its New Beat"). Polycom has certified its video conferencing room systems, RealPresence Group Series and RealPresence Debut, to allow BlueJeans customers to bring their cloud meetings to a Polycom conference room with enterprise-class audio and video technology. You can, with a single click, access a BlueJeans call from a Polycom device. The call includes innovations like NoiseBlock, HD Voice, and artificial intelligence integrated in the Polycom's cameras. Polycom's alliance with BlueJeans reflects their commitment to expanding choices for customers. Support with Zoom, Videxio, and Pragmatic is also available. Polycom also recently announced an integration with Amazon Alexa as part of the setup for video conferences. This news came out of Amazon's recent re:Invent event, when the company announced Alexa for Business (see "AWS Gives Alexa a Voice for Business"). With the integration, Amazon's Alexa can now be used to start a video conference with a voice command: "Alexa, start my meeting." Calls that can be added to the RealPresence Group Series calendar, including VMRs, Skype for Business, Office 365, and Zoom, can all be started by Alexa. You can also start an ad-hoc call that's not scheduled on the calendar. You can see a demo of this integration in action here.